Running With Tweezers is back from the holidays and we’re happy to be hosting the first Hay Hay It’s Donna Day of 2007! Thank you to everyone who voted us the winner of the risotto challenge – what a shocker that was! Also, thanks to Barbara of Winos and Foodies, the founder of HHDD and special thanks to il cavoletto di bruxelles for doing such a great job hosting #8! Yes. You read right. Souffles. They can be sweet…or they can be savory. My hope is that they are remotely fluffy and scrumptious looking. When done right, they are a creamy, airy vision. When they’re done wrong, it’s at least the makings of a good story. This is a challenge as much in the capturing of your delicious dish as it is its execution. Since I’ve been through the nightmare experience of doing it, I will be posting a styling related post in the next day or so for those of you who are choosing to take on this task! 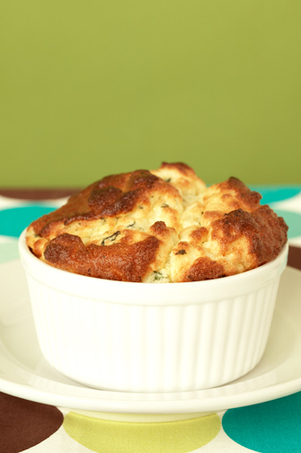 You may make a sweet or savory souffle. The only requirement is that it be an attempt to be the least bit souffle-like! You must post your souffle no later than January 27th, 2007. Once you post, please send an email to runningwithtweezers@gmail.com with the following information: the name of your blog, the name of your recipe, your name, your location, and a permalink to your post. The roundup will be posted & voting will begin on February 3rd with a winner to be announced on February 10th. The winner will receive a Donna Hay inspired prize to be named later and, most importantly, the chance to host the next Hay Hay It’s Donna Day! – Place the spinach in boiling water and remove after 1 minute. Drain. Squeeze all of the excess liquid from the spinach and chop. – Melt the butter in a small saucepan over medium heat. Add the flour and stir to a smooth paste. – Whisk in the milk then stir until the sauce boils and thickens. Remove from heat and stir through the spinach, egg yolks, cheese, salt and pepper. Allow to cool to room temperature. Preheat the oven to 210C (425F). Grease four 1-cup ramekins with butter and sprinkle with dry breadcrumbs to coat. Shake out any excess. – Beat the egg whites in the bowl of an electric mixer until soft peaks form. Gently fold in one third of the egg whites into the spinach mixture and then do the same to the remaining two thirds. Spoon the mixture into the ramekins and place on a baking tray. Bake for 15 minutes or until puffed and golden. Do not open the oven while cooking. Serve immediately as a starter or side dish. Serves 4. A leeetle bit eerie: I was just thinking “oh damn, I must have lost track of who’s hosting HHDD these days” and at that moment, your post popped up in my reader. Not sure if I can tackle this one, while our remodel’s going on, but… if a souffle can be made in my countertop oven, we’ll find out! Excellent theme! I’ve been wanting an excuse to make souffle again! I’ve never attempted a souffle before. This challenge seems like a great place to try it out! Bea – I’m sure whatever your picture it will look stunning. I’m up for this–what mad fun! don’t have a blog site though, can I post anyway? What a great theme, recently I bought some ramekins (http://gigis-rezepte.blogspot.com/2006/12/useful-stuff.html), now it’s time to use them. Never participated, and only just recently realized that I am the owner of a Donna Hay cookbook for a few years. The souffle has to come from a DH cookbook? And what if my DH cookbook does not include a souffle? Can I use any tried recipe? Isis – the idea is to take the recipe Tami has posted and make it as is or put your own spin on it by altering the ingredients. I am going to give this a shot even though I am very lame with my kitchen skills.